Carrie Underwood Opens Up About Her New Baby and "Figuring Things Out"
Carrie Underwood may be a country music superstar and multiple Grammy Award winner, but she admits she's "still figuring things out" just like the rest of us. Underwood and her husband Mike Fisher welcomed their second child, a boy named Jacob Bryan Fisher, on Jan. 21 and the family of four is adjusting to life with a newborn. They also have a 4-year-old named Isaiah Michael Fisher. The 36-year-old chatted with E! 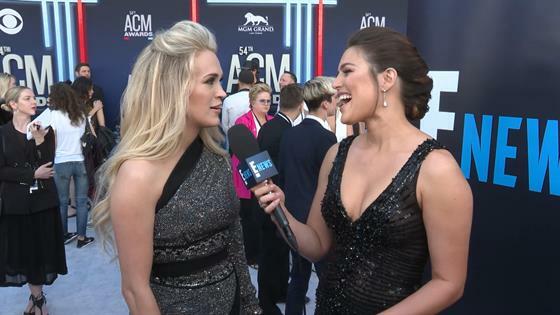 News' Carissa Culiner on the red carpet at the 2019 ACM Awards in Las Vegas on Sunday and discussed what life has been like for the past few months. For starters, Isaiah is diving headfirst into his role as big brother. "He loves it," the "Love Wins" singer said. "He calls Jacob 'My baby.'" Isaiah apparently goes around asking, "Where's my baby? How's my baby? I wanna kiss my baby." Although Jacob isn't Underwood and Fisher's first child, she admitted life with two kids has been a big adjustment. "We're still figuring out our groove, to be honest," she explained. Underwood added, "I don't know if we'll ever figure it out." The singer talked a bit about expectations that people have just because she's a celebrity. She's been candid about how "bouncing back" after giving birth to Jacob has been "difficult" and she's learning to appreciate her body the way it is. "I'm going to be honest, 'bouncing back' after having Jacob has been much more difficult than after I had Isaiah and I've been pretty hard on myself lately," she said in a March 19 Instagram post. "I just want to feel like myself again...for my body to feel the way that I know it can." Underwood told E! News that getting real about herself and dealing with everyday motherhood challenges is "just life." "People expect more of us 'celebrities,'" she said while also adding that she finds it weird to use that term. "Everyone is busy showing the highlight reels of their life, but life is messy." She continued, "I'm a mom first and foremost. That's my favorite. I love my job but that's my favorite role to play." The American Idol winner arrived at the MGM Grand Garden Arena on Sunday in a gorgeous one-shoulder Nicolas Jebran dress that was embroidered with diamonds and had thigh-high slits going up each leg. She performed on two separate occasions during the awards show and even prepped for the evening in a very relatable way—by pumping breast milk before the show. Underwood may still be "figuring things out," but with a new album, upcoming tour, Billboard Music Award nominations and more, she seems unstoppable from here.